Save time and money and book your transfer services before you go! This shuttle service will take you from Rome's Leonardo Da Vinci International Airport to your Rome Hotel, without the hassle of picking up a rental car, negotiating unfamiliar traffic and maps. Take the easy way - book this efficient service online now and save time at your destination! 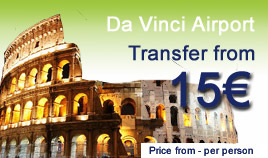 Private transfer service is also operated from Fiumicino Da Vinci Airport - A good bargain for groups of 4 or more. It is also the favorite of Senior citizens, travelers with heavy luggage, disabled persons, or families with small children in tow. Thank you for visiting our site. Our ground transportation remains the easiest and most economical way to move door-to-door from the airport to the center of Rome. Transfer is operated in comfortable air conditioned vehicles with courteous English speaking drivers. Please click on the "Da Vinci Airport Transfer" button and select the airport shuttle you need either Arrival pick up or Departure. Private airport transportation : You care about your privacy and want to book a private airport pick up.